We know this was issued as a single in 1986 but didn't appear on album until 1989 Lovelines. So what import airplay are they talking about that prompted a single 45 release of this ballad in the US? Maybe I'm reading into this but it's hinting that the song was played (outside the US) and because of that airplay it prompted a US release. ^^I believe you are correct. Honolulu City Lights/I Just Fall In Love Again. 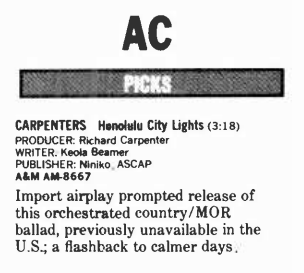 I've detailed the story before, but it was in the summer of 1986 that I was standing around in a car dealer's showroom and heard "Honolulu City Lights" playing on a sleepy beautiful music station on the dealer's radio choice display. I recognized Karen's vocal, but not the song. I never heard it again until LOVELINES. Oh that’s right, thanks Gary I had forgot about it being issued in Japan on a cd single. Has anyone seen this Cd single? The Cd jacket looks like the 45 single sleeve but was the Japan Cd single a separate jewel case or a cardboard sleeve? I had a 45 rpm vinyl Single with the sleeve given to me from a DJ in the summer of 86 or 87. He said it was out prior that year as a radio single and would be happy to give it to me. I was elated as those were the days that things were difficult to come by. About 15 years later I met a new fan who had a copy of the Bokotan and Australia live concerts and let me borrow them for about a month for viewing pleasure and as a thank you I gave him my copy of this single and a Passage mug. Sometimes, I wish I still had the mug, but it was all I had to offer for thanks. The kindness and knowledge of this room has more than been a thank you for those days for he introduced me to this corner of friends. Living in Atlanta at that time had its advantages for it had a lot of opportunities to meet people with a variety of interests and it was a great area for meeting other fans. I still don’t have a copy of those concerts but their availability on YouTube provides viewing pleasure today. Music is to share and life has certainly proven that the staple of kindness comes full circle. Does anyone on this forum have this bonus single Cd that they can provide a photo of the disc and covers back front and inside? Harry do you think you could add a blurp about this Cd single for Honolulu from Japan in the resource site? When I saw this ad and the mention of import airplay I went to the resource site for this song but there was no mention that it was first released in Japan then due to its airplay was eventually released in the US. See this post where a member posted his "Collection" photos and specifically the Honolulu single. Harry do you think you could add a blurp about this Cd single for Honolulu from Japan in the resource site? Did you also have the 1986 Japan box set listed in the resource site? I couldn’t find it under compilations? Thanks I missed this post. So these would have all been non remixed reversions on this first box set? All box sets from the 80s into the mid 90s supposedly utilized the mixes that were first put onto CD. The few exceptions are that A SONG FOR YOU later took on the remixes used for the MFSL version, and PASSAGE had the remixed "Calling Occupants..." These were true of the CARPENTERS COLLECTION that was released in the UK. But since I don't own this early set, I cannot confirm the mixes used, but I suspect that they are all the mixes used on the earliest A&M CDs. I know that ‘Honolulu City Lights’ made its first debut anywhere with the release of the Japanese ‘Anthology’ set in 1985. I didn’t get my copy until 1987, which it turned out was under rather dubious circumstances. My copy of ‘Anthology’ is a press copy. A lady at A&M was selling publicity vinyl copies of that album plus ‘Live In Japan’ out of A&M’s International Department. I think I sent her a money order. I thought it was odd, but I sent the $$ anyway. She was eventually fired from A&M for illegally selling their promo copies to fans. But I’m still glad I obtained my copies, as they’re great to have now. I think she charged me $80 for ‘Anthology’ (it wasn’t sealed) and $50 for ‘Live In Japan’. Lol. Oh, well! there is a lot going on in this song. From the keyboard performance, to the percussion, to the horn-section. In fact, another for which Karen's background harmonies are outstanding. as well as arranged the song. So, clearly I enjoy this song. Karen shows just how versatile her lead vocals can be ! It’s interesting to see that the sequencing of this song is the same on this album and on the solo album: it kicks off both sets. Karen and Phil obviously thought it was strong enough as an album opener and clearly Richard felt the same. The same applies to Remember When Lovin’ Took All Night, which opens side 2 of each album as well. ^^Stephen, that is an astute observation ! Until you wrote it, I did not think about that ! There’s an interesting comment by Liberty Devitto in Rick Henry’s book “The Carpenters Online Interviews” about Karen’s solo tracks. It shows that even on her own she had the knack of recording things sometimes in one take. LD: "Remember When Lovin Took All Night", that’s my favorite. It's the way everything fits together, the groove , her voice, the amazing background vocals. Its all there. Rod [Temperton] was fantastic with vocal arrangements. The vocals were done after the music tracks were cut. Karen had recorded a scratch vocal with the band. I think Phil used most of that vocal. There’s also this anecdote from Russell Javors, who submitted four tracks for the album. RJ: Rod was an interesting guy. He was around a lot while we were working. He arranged a little background vocal part on "Still In Love With You". Bob [James] arranged All Because Of You. My demo of "All Because Of You" was darker than Karen's version. It had a slide guitar and an orchestra. Karen hummed the slide guitar part in the intro of her version. ^^I assume, from above (Liberty DeVitto) that a "scratch" vocal is equivalent to a "work lead." But, I wonder how that process may have differed from an ordinary Carpenters' song. Also, how much of that "scratch vocal" differed from the vocal "done after the music tracks were cut." And, of course, are there other vocal takes extant ? Wouldn't that be something to hear ? Now, regards the album Lovelines. This album is one of my favorites. (1) Had it been released the week of The CBS-Movie being aired, it might have charted higher. one actual Single...a one-sided single ?....to promote it. If I Had You, why no "B" side song ? The album, in my opinion, is an excellent album. Too bad, not enough promotion (at release time) . but there was a ten month gap between the movie and album release ! Too bad, not enough promotion (at release time) . It's hype-sticker tied in to the CBS-Movie (and 20th Anniversary), but there was a ten month gap between the movie and album release ! I guess Richard was busy with each separate project to have done both, but the album would definitely have benefitted from a release date that closely tied in with the airing of the movie. A double album would have been really cool - one CD similar to 1990's Their Greatest Hits, containing all the hits heard in the movie, with Lovelines as the other. “The Uninvited Guest” was the B side to “If I Had You”, in North America and it was a Karen Carpenter solo cassette single, which is by far probable the scarcest of all Carpenters singles, next to “Karen’s Them” and “Druscilla Penny”. In Japan “Lovelines” was the B-side to “If I Had You (and it issued under the Carpenters banner), but by far the PROMO CD with just “If I Had You” seems to be the most common release for the single. I neglected to include it as a regular single release. Even on the PBS set “The Uninvited Guest” is credit as the B side. I bought 2 at the time of release. One of them is still sealed. It was most definitely a regular release, and I heard it a LOT on FM AC stations.